What’s that you say? 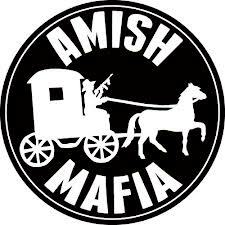 Amish Mafia is fake? Well outten the light, I’m in shock. It doesn’t matter if the skirmishes are re-enacted from past events. It doesn’t matter if the skirmishes are made up from scratch. What matters is the entertainment value found within the show highlighting a town I could drive to in less than an hour. Lebanon Levi, Esther, John, Merlin, Jolin, Allen and the rest of the cast: I don’t care if the show is scripted. I get a kick out of seeing an area I recognize combined with outrageous antics involving horse and buggies, hookers and very scary guns. They are all on Twitter #Amishmafia Find them. Brush up on your Pennsylvania Dutch. If you haven’t tuned in to the Discovery Channel to check out Lancaster, PA and its “mafia” you better do so soon. If not, they might come looking for you! Seen the show? What do you think? Maybe Dutch Wonderland will have a surge in attendance…just add an Amish Mafia ride. More written this this original post. I know right! Levi looks like he can get lucky with this new girl….I think Esther is jealous.